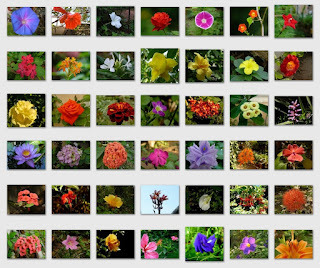 What has photography got to do with gardening? Find out! My passion in Photography, among my other hobbies, was to take shape. 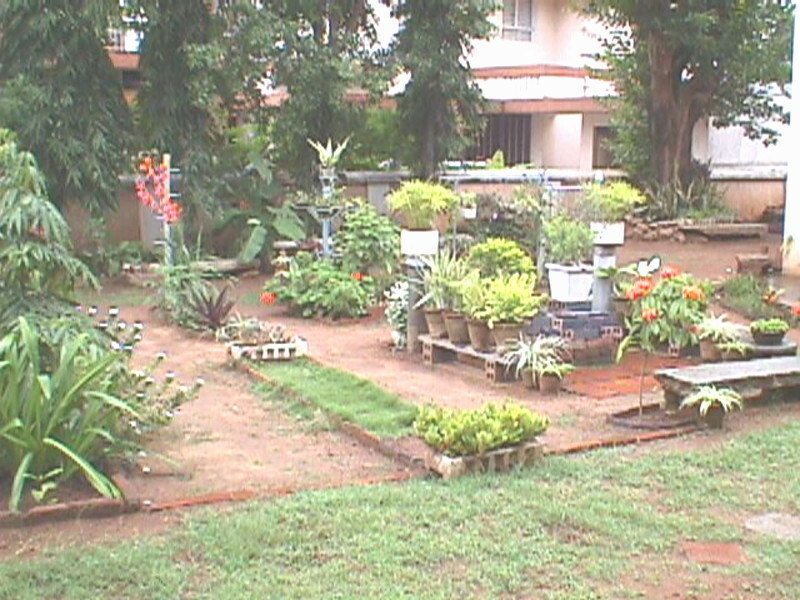 When I saw pictures shared by others on Dave's Garden I was tempted to take my pictures with my film camera, but uploading was a cumbersome process for me [at workplace]. Generous help came from my colleague's husband, Mr.Thomas. He was aware of my love for plants. When I told him about DG, he offered to lend his Sony Mavica digital camera for a day or two whenever I required to take images. I was on Cloud 9. It was one of the earliest models that recorded images on a 1.44MB floppy disk. Some flower images I captured with it in that early stage when there was plenty of variety in my garden drew some audience! I am profoundly thankful to Mr.Thomas for such an encouragement. In fact, he became an important link in the long chain in the events that followed. 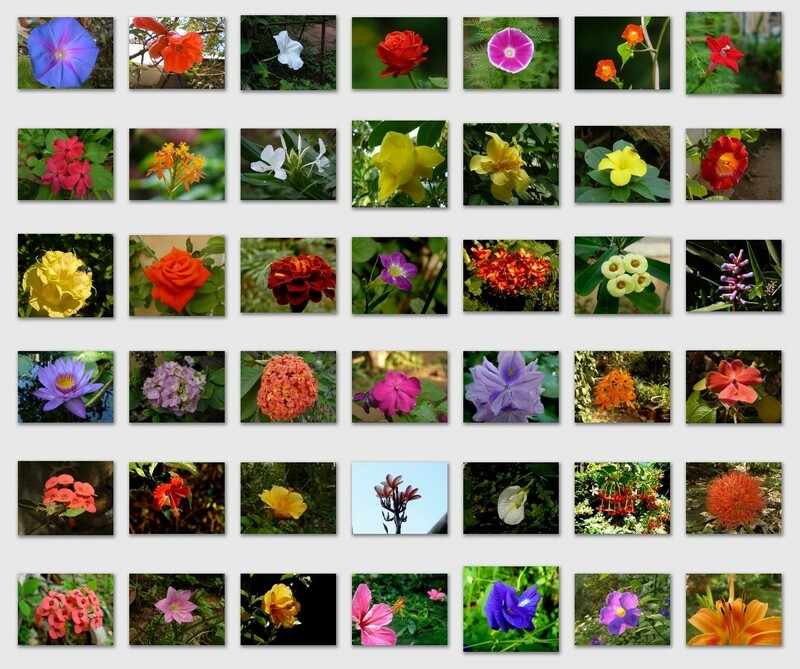 DG's plant database provided invaluable information to gardeners around the world and my pictures added value to it. The database had got popular worldwide. 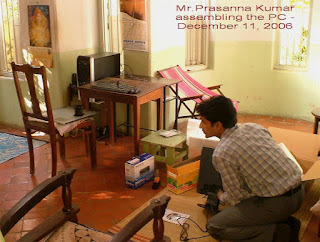 Despite the images having limitations [due to available technology at that time, only 10 years ago!] people used to express their appreciation of the few images I used to share. One day Mr.Thomas informed the bad news that his Sony had been spoiled by some neighbour who had borrowed. In the meanwhile, newer things had already begun to take shape. 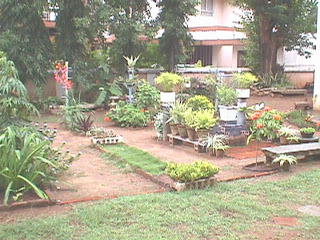 My garden in 2005, taken with Sony Mavica. I was so happy with this quality at that time! I had uploaded this to the database. I was so thrilled! 2006 was a year that brought about many changes. My cyberslacking was no longer a secret among fellow gardeners on DG and even many 'understanding' colleagues. So also, about my borrowed Sony. 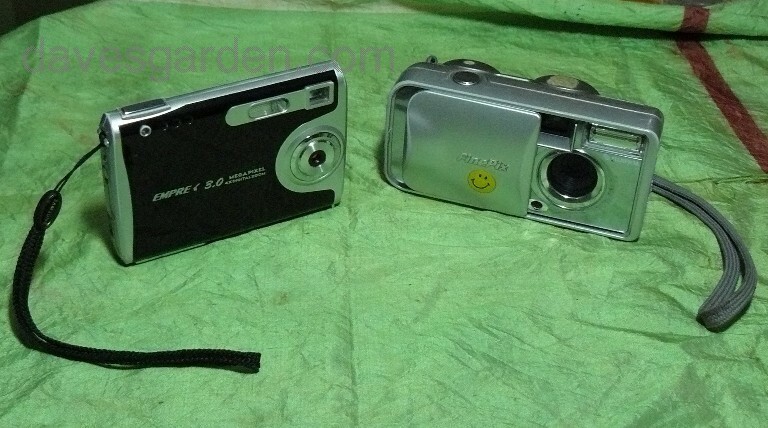 A kind elderly DG member, Mr.George, sent me his small Emprex Digital Camera [DC] that he did not need. It became my first DC! My neighbourhood friend Sathish who came from the US at that time carried it for me. Shortly afterwards, a lady DG-er, Kim from Pennsylvania, United States worked out a plan without my knowledge, to send me a Fuji which turned out to be a wonderful 'upgrade' to Emprex. Kim had seen my pictures and wanted to gift me. This time, I had requested my old friend Kashi who was coming down from Chicago to bring it for me. So Kim had sent it to Kashi. George's Emprex on the left, Kim's Fuji [FinePix A120] on the right, posing for me! 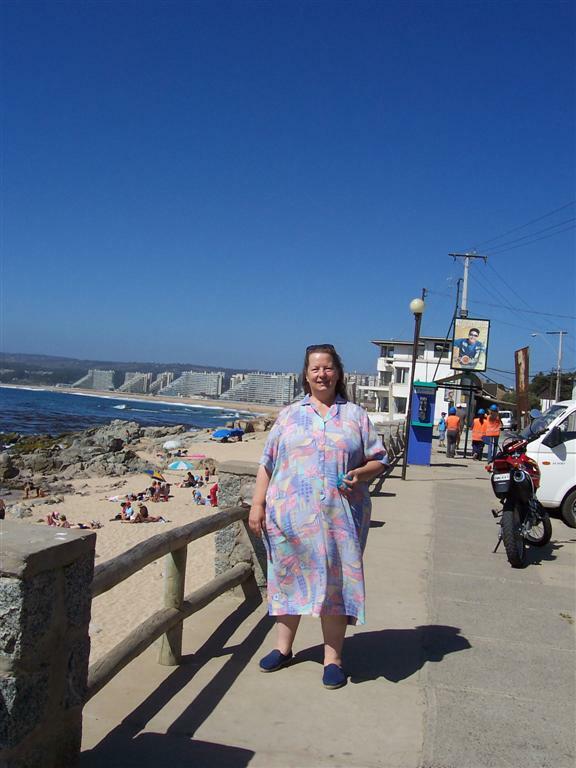 Around the same time, a kind elderly lady Ursula from Chile, South America had already secretly planned something for me. She was half way round the Earth and not familiar to me at all, except for an earlier occasion when she had collected my address and sent me a wonderful packet that contained numerous varieties of seeds. I came to know later that she had done it to many others as well, in acts of generous giving. 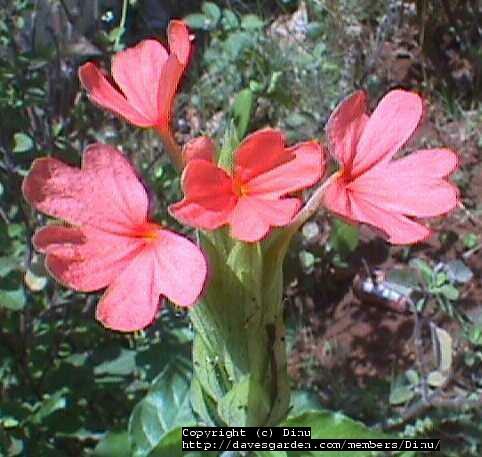 It is unfortunate that none of the seeds germinated well enough to survive. Ursula later wrote that she was following my posts and pictures. As was her wont, wanted to do something to 'better me'. Fuji was taking good pictures. It went kaput after a long service. Ursula's e-mail in my inbox one day was to change many things. I did not know what to do after reading it. She wrote that Dave and team had earlier permitted her to go about in the 'Dinu Project' [completely without my knowledge] and that a whopping sum of $1000 was collected! Her main intention was to present me with a good digital camera as she loved whatever scenes and descriptions I posted in the discussion forums. There was appreciation of my pictures from many members but she went one step ahead. I later learnt that Ursula had earned a very fine reputation among gardeners and that there were many recipients of her wholehearted generosity. We exchanged e-mails. She expressed her physical condition and also the various situations when luck had betrayed her. It was really touching that such a kind-hearted person was so much tormented by life. It is natural in the usual course to doubt actions like these from strangers, but her honesty, sincerity and affection were writ all over her mails. What a human I thought! 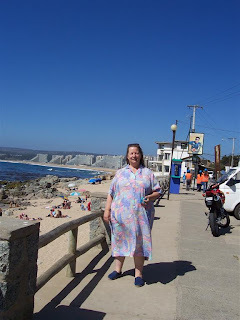 Ursula lives close to the Andes Mountain Range. Despite her arthritis among other things, she collected many plant seeds from the mountain slopes, sorted, packed, labeled and had sold online. Her 'Dinu Project' found overwhelming response, much beyond her expectations. Now she made me accept this gift from her effort. Decision to accept was very tricky. But I did it on my own condition that this is going to be a 'pay forward' thing, which found Ursula's liking. This chapter of my story will remain incomplete till the condition gets fulfilled. I will revert and write here whenever that happens to 'complete the cycle'. Kashi had also carried this thousand dollar cheque along with Kim's Fuji. Since the amount was that much, Ursula suggested me to buy a PC! After getting some inputs from another kind friend Kimberley in Ohio, I chose the PC and got it assembled. There was some balance left from it, enough now for a digital camera, which in fact, was Ursula's main intention. Another kind friend Ashok guided me to his friend Murali who was on a business trip to US. He was kind to agree, buy and bring. 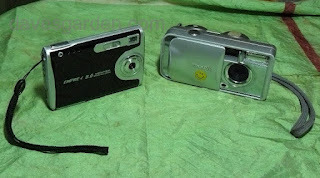 After reviewing many models on the Web, Panasonic Lumix FZ8 was chosen and Murali was let known. This was also just right for the available budget. He brought it to Bangalore and my cousin Ravi picked it up for me. I collected it during my visit to his parents' house soon afterward. Panasonic FZ8 just opened from the box. Took the shot with Fuji. An old picture she sent from Santiago, Chile. She taught me the joy in 'giving'. She made me receive! This changed the way I lived. It changed my outlook, opened new pastures and naturally the way I 'gardened'. Such exceptionally noble acts can move many a heart. That this Angel is unavailable for communication is a matter of concern to many on DG. But I learn that she is not having proper access to the internet where she is now living [after she moved her apartment, building her own, using eco-matarials near the hills] and I hope she is okay and all we can do is pray for her well being. Internet connectivity that naturally followed its way to our house also was to alter our routines. Despite that, my cyberslacking was unaffected! In another instance of kindness and generosity on DG, among several, was when another kind lady Debi [from Massachusetts] simply sent my daughters some Barbie Dolls and a lot of little knick-knack gifts - the huge parcel brought so much joy to all of us. She later said she loved kids! She had sent me some day lily bulbs too. They bloomed two seasons and could not survive the tropics. You must be wondering why I have named as 'Dinu's Yarden'. I love this word 'yarden'. It was my Chinese friend Jianhua, also on DG who is to be credited for this new word: Yard + Garden! 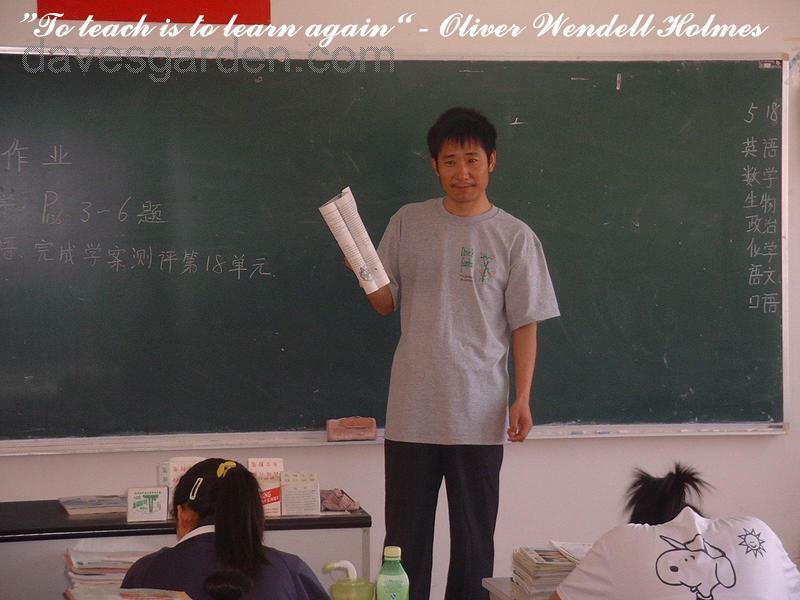 He is a very talented and dedicated school teacher in China and a very enthusiastic gardener. What a wonderful person! When I informed him about this, he was kind to allow me to use this picture. Don't miss the DG T-shirt Jianhua is also proudly wearing. DG also has brought about many friendships across continents. It brought one Kenton from the US, here to "My Eden". Camera and Computer became important e-tools that brought out many latent things out of me. There came another new website called "Cubits". One American gardener Nancy wanted to interview me for her article in that site. It was for her 'Spotlight' series. It was fun to answer some questions. When my other posts follow, the photography aspect that I mentioned at the outset, will get shown. But here is a collage showing the tip of the iceberg to end of final and Part 3 of the 3-part series.